Amy Marcy Cheney Beach (1867-1944) was a prolific composer of music for piano, voice, orchestra and choir. Her early piano works, those written up to 1894, are presented on the first volume of this set of discs. The second CD in the series contains those works from Op. 36 of 1897 to Op. 64 of 1907. This third disc is of Beach’s pieces for piano from 1907 to 1924. It was a transitional time in her life, as her husband of twenty-five years died in 1910 leaving her to pursue her own interests. Her mother died soon after, in February 1911. Later that year Beach left for Europe, not returning until 1914. Having worked through her grief, travelled, and promoted her music through public performance, she came back to the U.S. sure of herself and with newfound zeal for her work. Under management, she toured the country playing her chamber music, vocal pieces, piano solos and the piano concerto. In 1916, Beach made her permanent base in Hillsborough, New Hampshire, the birthplace of her mother, living with her cousin and aunt. In 1921, Beach began her long relationship with the MacDowell Colony, spending the summer composing at their retreat in Peterborough, New Hampshire. She found the quiet and closeness to nature inspiring, as well as the contact with other artists, writers and musicians resident at the Colony refreshing. Beach became close friends with Marian MacDowell, the composer Edward MacDowell’s widow, spending much time over the years at the Colony composing. Fantasia fugata, op. 87, published in 1923, is a concert fantasy based on the traditional prelude and fugue format. It opens with a flourish of octaves preceded by grace notes, a motive which later forms the basis of the fugue subject. Beach wrote that this gesture was inspired by Hamlet, “a large black Angora who had been placed on the keyboard with the hope that he might emulate Scarlatti’s cat and improvise a fugue theme.” The extended opening section uses the grace-note motif to explore harmonic sequences with arpeggiation. This section acts as a ‘prelude’ to the more extensive fugal section which follows. In three voices, the fugue begins with underlying quaver rhythms supporting the theme. The next section uses semiquavers to develop the material sequentially. This is followed by a second theme, a rising subject with a somewhat jazzy rhythm, also presented in three voices. The earlier sequential development of the first theme returns, moving through different harmonies, to lead to a grand final statement of the fugal theme in left-hand octaves, followed by the second subject in right-hand octaves. Fantasia fugata ends with a tremendous final cadence, a satisfying conclusion to a well-crafted concert piece. Begun in 1906, Beach completed Les Rêves de Colombine, op. 65, in the spring of 1907, the same year in which she later finished her masterful Quintet for Piano and Strings in F# minor, op. 67. In Les Rêves de Colombine, Beach takes the French pantomime character Columbine, usually depicted as the daughter or servant of Pantalon and in love with Harlequin, as her inspiration. Also titled Suite française, Beach uses traditional forms (prelude – gavotte – waltz – adagio – finale: dance) in the organisation of her suite of Columbine’s dreams. In the first of these pieces, La Fée de la fontaine, Beach has Columbine visualising the fairy of the fountain. Beach remarked that it was about “a capricious, a fierce and sullen as well as gracious fairy.” This is followed by Le Prince gracieux, a gavotte which imitates a prince who has caught Columbine’s eye dancing gracefully and lightly. The next piece, Valse amoureuse, is a romantic waltz, where Columbine dreams of “a sweetheart with whom she is dancing.” Beach used material from her song, “Le Secret,” op. 14, no. 2, as a basis for the waltz. This is followed by Sous les étoiles, a slow serenade in which Columbine gazes at the stars and dreams of love. The final movement, Danse d’Arlequin, opens with a snippet of Valse amoureuse, and then Harlequin jumps in, whirling about in a light, high-spirited dance. A more dreamlike transition follows with arpeggiation between the hands, leading to material from the first movement. The climax of La Fée de la fontaine is repeated exactly, and then Harlequin returns in his dance, building to a frenzied climax. Columbine is next reminded of her sweetheart with material from Valse amoureuse quietly following, before Harlequin finishes the movement with a flourish of his dance. The Lotos Isles is very similar to a song of the same title for soprano and piano published by Beach in 1914 as Op. 76, no. 2. The text for the song is taken from Alfred Tennyson’s “The Lotos-Eaters”. The piano piece uses the same accompaniment pattern as the song, but develops this into melodic material in its own right. Beach writes an additional introduction and coda for her piano piece, and only obliquely refers to the melody of the song version. Also, the piano piece is in 3/4 time, while the song is in 4/4. So while there are strong similarities, the piano piece stands on its own as a work and is not a transcription of the vocal piece. Prelude and Fugue, op. 81 was begun in 1912 during Beach’s stay in Germany, performed in Boston in 1914, but then not published by Schirmer until 1918. The letters of Amy Beach’s name (A. BEACH) form the theme. This work references Liszt’s Fantasy and Fugue on B-A-C-H (1871) with four letters shared between Liszt’s theme and Beach’s (B-flat, A, C and B natural [the German for H]). Beach studied in Boston from 1882 – 1885 with Carl Baermann, a pupil of Liszt’s. In her work, Beach uses A. B-E-A-C-H both in opening the Prelude, written like a fantasy, and in the fugue subject. The prelude is sectional, and the theme is first presented in low octaves with sextuplet flourishes in both hands following. The theme is then set in full chords over sustained bass A octaves, marked fortissimo. This leads to a dolce cantabile section of development, first in arpeggiated figures, then in chromatic thirds, followed by more left-hand figuration accompanying the transposed theme in the right-hand. A bombastic octave sequence follows which builds to a climax. Silence. Then beautiful ppp arpeggios in both hands lead to a quiet chordal reminiscence of the theme. Beach creates a very special moment, and in that mesmerising stillness comes the fugue. In four voices, Beach presents the subject very simply with quaver accompaniment patterns. The tempo then becomes slightly faster and a triplet underlying rhythm is introduced, with each voice again brought in in layers. The next section uses a semiquaver accompanying pattern with a lively countermelody introduced, which is then developed in its own right. After a build-up using this material, Beach brings the whole piece down to ppp with an octave ostinato pattern in the left-hand based on the counter-melody undergirding a choral development of the subject. This grows, and maestoso octaves of mounting fury lead to a grand statement of the theme in low octaves, the counter-melody second subject in upper right-hand chords, and semiquaver octaves running between the two voices. Truly Lisztian in both technique and the way three-hands are suggested but only two employed, Beach is in her finest compositional form in writing the passagework that brings this work to culmination. It is an impressive tour de force, one of her most important piano compositions, and a brilliant concert work. From Blackbird Hills, op. 83, published in 1922, is subtitled ‘An Omaha Tribal Dance.’ The Omaha are a Native American people who then lived in the Great Plains in the American Midwest. Amy Beach was greatly interested in folk music, as evidenced by her large-scale Variations on Balkan Themes and her set of four short pieces based on Inuit melodies, Eskimos, op.64. From Blackbird Hills opens with the tribal dance in duple meter, lively and quick, the melody first in the right-hand and then in the left. This is followed by an Adagio which uses the same folk melody, but in an expanded rhythm with underlying harmonic development. The opening section returns note-for-note, but then falls into a different sequential development which leads to a truncated return of the Adagio section. A presto coda based on the opening of the piece brings From Blackbird Hills to a brilliant finish. The Fair Hills of Éiré, 0!, op. 91, takes as its melody the Irish-American folk tune by the same name that Beach was introduced to by Padraic Colum while at the MacDowell Colony in 1921. Ban Chnuic Eireann O begins: “Take a blessing from my heart to the land of my birth, And the fair hills of Eire, O!” Beach sets the melody first with simple left-hand accompaniment, keeping the rendering plain and folk-like. Then she writes a quiet chordal triplet pattern for the right-hand and lets the left take the melody. The piece becomes more virtuosic with semiquaver figuration introduced. The melody first comes in the middle voice, then in big chords with arpeggio sweeps in the left-hand. A simple, evocative statement of the folk tune ends this lament for the homeland. The piece, in E-flat minor, begins in the depths of the piano and rises, with an undulating triplet pattern of great beauty emerging over a quaver accompaniment. The melody comes in, floating above the gentle movement, to create an atmosphere of utter tranquillity, a prayer-like state suggested by the poem. The song of the thrush enters, freely notated in grace notes, floating on the dusk air. Beach brings the main tune back in, and then more thrush song, creating an absolutely gorgeous piece of music with profound depth. In D minor, this piece is written as a slow waltz. The thrush song is evident from the start, being part of the melodic impetus. It is in quasi-rondo form, with the second and fourth sections being more dramatic and developmental, moving through extended harmonies and only alluding to the thrush motive. From Grandmother’s Garden, op. 97, also written at the MacDowell Colony in 1921, is a suite of pieces in which each movement represents a wildflower. The first, Morning Glories, has fast arpeggiation between the hands with the melody set in the first note of each left-hand group as it sweeps up. The ripples depict the flower by the same name which is fleeting and short-lived. The blossom usually lasts just for the morning. The second piece, Heartsease, is quiet and beautiful, painting a picture of the flower more commonly known in America as Johnny Jump Up. In D-flat major, the soothing melody comes three times, first in the middle register, then an octave lower, and finally in the right-hand over a beautifully written descending bass line. Beach’s extended harmonies and modulations create a lush environment for the Viola tricolor to flower. Mignonette, the third piece in this cycle, is translated ‘little darling’ and is a plant with tiny, fragrant flowers which grow on tall spikes. Yellowish-white in colour, its Latin name is Reseda, “to calm,” and it was utilised by the Romans on bruises. Beach writes this exquisite little piece in the style of a minuet, apropos for its title, Mignonette. Rosemary and Rue, are flowers which connote remembrance. A nostalgic movement, Beach sets a gentle chromatic melody over a simple left-hand chordal pattern to represent rosemary. Rosemary, as a herb, is linked with improving the memory, and as a flower has been used at funerals to represent the memory of the deceased living on. Shakespeare, in Hamlet, gives Ophelia the line, “There’s rosemary, that’s for remembrance, pray, love, remember.” Beach uses rue for her second theme, written as a sustained melody in the left-hand with quiet right-hand quaver accompaniment in thirds. Rue was known as the Herb of Grace and was traditionally used as an antidote to poisons. After building to a climax, Beach brings back the rosemary theme, but then ends the movement with another section of the rue melody. Honeysuckle, the last movement of the suite, is a fast waltz, á la Chopin’s Minute Waltz. Honeysuckle as a plant is a climber, with long tendrils which twine around anything handy. It is beautiful along a trellis or growing up a garden fence, with clusters of flowers along its length. Beach twines the melody round and round, like the honeysuckle, in running right-hand patterns. The ‘B’ section is slower, still a waltz, but with a simpler melody which is a perfect foil for the intricacies of the first tune. The opening ‘honeysuckle’ theme returns, to be followed by a very quiet reminiscence of the second theme. This is an exquisitely crafted movement, a brilliant example of Beach at her best in writing miniature forms for piano. Two Pieces, op. 102, was published in 1924 and dedicated to Olga Samaroff. The first piece, Farewell, Summer, has at the top lines which read, “O last of the free-born wildflower nation! Thy bright hours gone and thy starry crest: Three names are thine, and they fit thy station, Frost Flower, Aster and Farewell Summer, But Farewell Summer suits thee best!” The title of the piece, therefore, has a double meaning. It is saying goodbye to the summer months as well as depicting the flower of the aster family called Farewell Summer. Beach writes the first section of the piece in the style of a gavotte, with a light, playful character. The middle section is more introspective and marked legatissimo, with the melody in the middle voice and a quaver accompaniment in both hands lulling the listener in a dreamlike manner, remembering the days of the summer. The second piece, Dancing Leaves, is exactly that, a cascade of leaves dancing in the autumnal breeze. Marked molto vivace, Beach uses chromaticism, a light left-hand accompaniment and staccato right-hand patterns of parallel thirds and fourths to paint the picture perfectly. It is good to hear her [Johnson] again in this, the third of four planned releases of the complete piano music of Amy Beach (1867-1944). The works here are from Beach’s mature years (1907-1924) and use the opus numbers from 65 to 102. Just about every aspect of Beach’s compositional talent is evident here, in a variety of styles. …From a purely musical standpoint, you hear influences of French Impressionism, German late-romanticism, as well as a healthy helping of good old Americana….Johnson’s detailed and perceptive booklet essay is a wonderful addition to her piano playing. The recorded sound is quite good, and I now must search out the first two volumes in this series (July/Aug 2008). While waiting for the final installment, I remain grateful to artists such as Johnson for allowing this music to be heard at its best. Her artistry and pianistic skill, as well as her obvious devotion to the material might even sway some of the women composer nay-sayers. Audiophile Audition seems to have missed the first two volumes in this series, “The Early Works”, and “The Turn of the Century”, but based on this current (and penultimate) issue, the other two are certainly worth exploring. Amy March Cheney Beach (1867-1944) was one of the most important women composers to have ever lived, and only now is a critical reassessment of her music underway….In many ways Beach’s piano music reminds me of Edward MacDowell. There is always a slight whiff of the parlor present, but both of these artists, whose lives did overlap, infused their miniatures with so much more than trite melodies and conventional harmonies. For Beach, her piano music is a series of exquisite tone poems, inextricably wedded to their titles. The beauties of her compositional aptitude are present in the many ways she separates the hands, making each a distinct contributor to the gleaming romantic and impressionistic facades she produces, or the magnificent sense of variety in her technical facility as she constantly searches for new ways of translating verbal and poetic constructs into musical logic. I could listen to this album over and over. 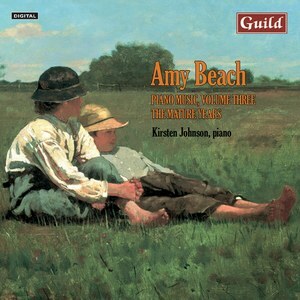 A number of fine piano recordings have crossed my desk over the years, but few have given me as much pleasure as the second volume of piano music by Amy Beach, most beautifully played by Kirsten Johnson. Indeed, I was so smitten that I made it one of my picks of the year for 2009. This might explain why I was so eager to hear this third instalment, a well-filled disc of Beach’s later pieces. Given Johnson’s real affinity for this composer and Guild’s exemplary sonics, this promised to be a cracker. Beach was interested in folk music – take her Variations on Balkan Themes, for instance – so it’s no surprise to find that From Blackbird Hills is subtitled ‘Omaha Tribal Dance’. Prancing rhythms co-exist with music of surprising inwardness, yet another of those now familiar juxtapositions that make Beach’s music so fascinating. And speaking of folk tunes, The Fair Hills of Éiré, O! is injected with just the right amount of pathos; this ability to hold fast to the music’s sentiment and not give way to sentimentality is one of Johnson’s sterling qualities. Speaking of which, the silvery tones of A Hermit Thrush at Eve ‘in the original key but an octave lower’ are simply gorgeous. There’s an arresting stillness to this performance that’s entirely apt, the Guild team capturing every vibration and tremor with astonishing fidelity. After something of a gap we now have the third instalment of Kirsten Johnson’s survey of the delightful piano music of Amy Beach…. This volume selects ‘The Mature Years’, so we approach Beach between roughly 1907 – when she was 40 – and 1923, when she still had another two decades to live. …Johnson prefers a more beguiling, softer and rounder sound world. The result is that Johnson stresses the romanticism at the music’s heart…. In From Grandmother’s Garden Johnson is once again more limpid in her romanticism, and less assertive tonally and chordally too. She has the confidence to unveil Beach’s miniatures naturally and with unforced generosity…. If you prefer a more carefree, light-hearted, beautifully deft Beach, go for Johnson.